Fascism is death — this is a truth all communists know. However, there comes a time when knowledge of the truth alone is not sufficient, a time when it is necessary to grasp that truth and wield it in the name of self-preservation. 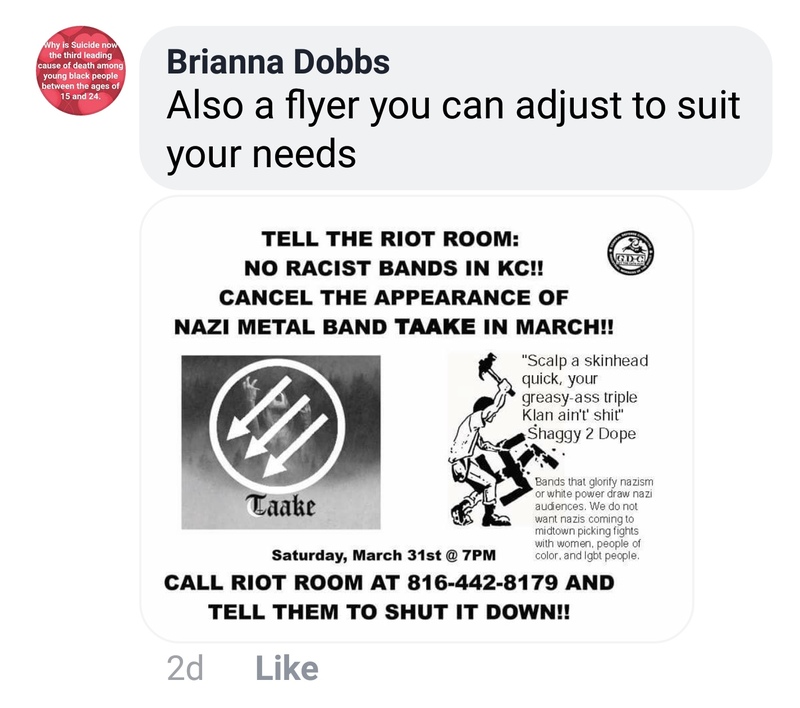 Fascists and their organizations are bubbling up from every crevice in this country, emboldened as they are by their demagogic leader Trump, and the pacifist nature and indifference that characterizes much of the resistance to Trumpite fascism. Yet a more militant resistance is emerging, one that we wholeheartedly support and seek to enrich. A resistance based on the immense power and determination of the working class and oppressed masses, increasingly being led by their most conscious and militant defenders, communists. The duty of every communist is to serve the people regardless of personal gains or losses. This is the lifeblood that sustains a revolutionary movement and truly makes us invincible, namely, the trust, admiration, and love we have for the People, and the People for us. It is because of our communist duty, and our understanding as Marxist-Leninist-Maoists that fascism will only crumble when struck, that we must take self-defense seriously, both the armed and the unarmed type. Recently a march for prisoners was held in Kansas City to protest the vile and criminally torturous prison system that imprisons our class, and particularly the Black and Chicano Nations en masse. Spirits were high as many people passed by a recently vandalized Confederate monument, an act that dedicated communists took upon themselves based on the overwhelming desire of the masses to see it removed, yet for all the successes of the march there was one glaring problem. A small detachment of armed Three Percenters had positioned themselves on the perimeter of the march to, in their words, “protect” and “ensure the safety” of the march. Knowing the political character of Patriot groups like the Three Percenters, and having directly confronted them at a recent counter-demonstration of the fascist group ACT for America, we know that those words are hollow. Their role, like that of the police, is that of the foot soldiers and ideological partisans of this decaying reactionary order. 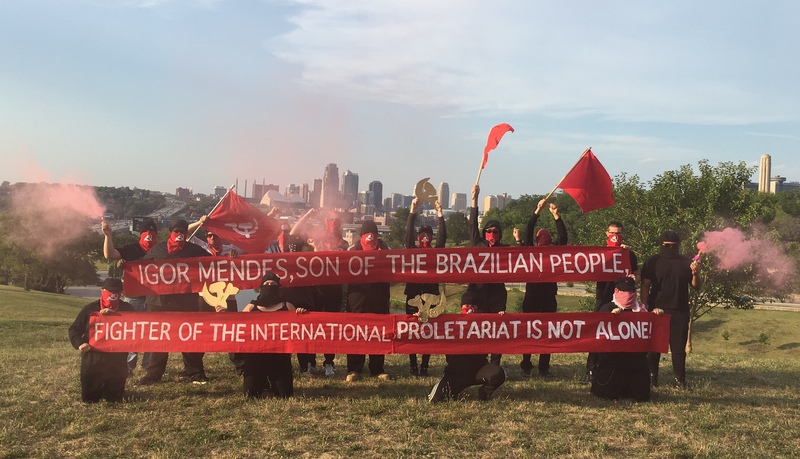 Their presence was a clear political statement of their intent to work hand in hand with the Kansas City Police Department to corral and harass the People and to continue their clamp down on local communists. The following day provided more damning evidence of the direct collaboration between the police and local Patriot groups. 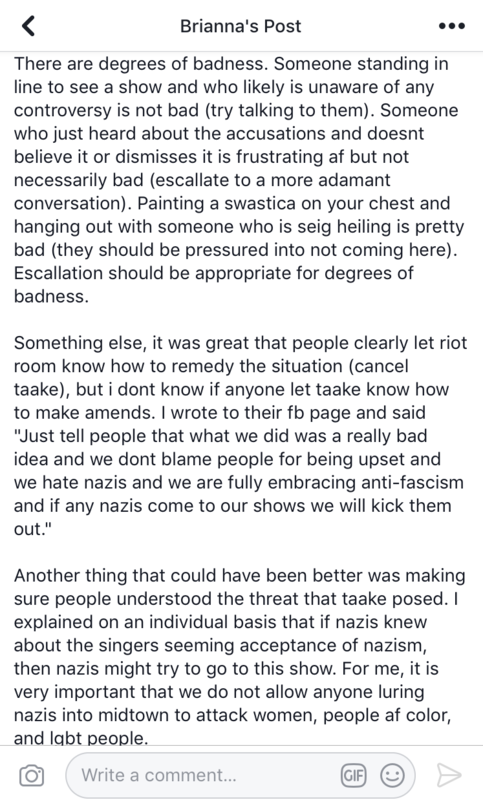 An anonymous source emailed us a video showing the militiamen and the police debriefing each other before Sunday’s action to protest the Confederate memorial, which had already been prepped for removal thanks to the direct action of communists. Many ordinary people at both events were noticeably alarmed and shaken by the presence of the Three Percenters, which turned to outrage and righteous anger once their alliance was exposed. 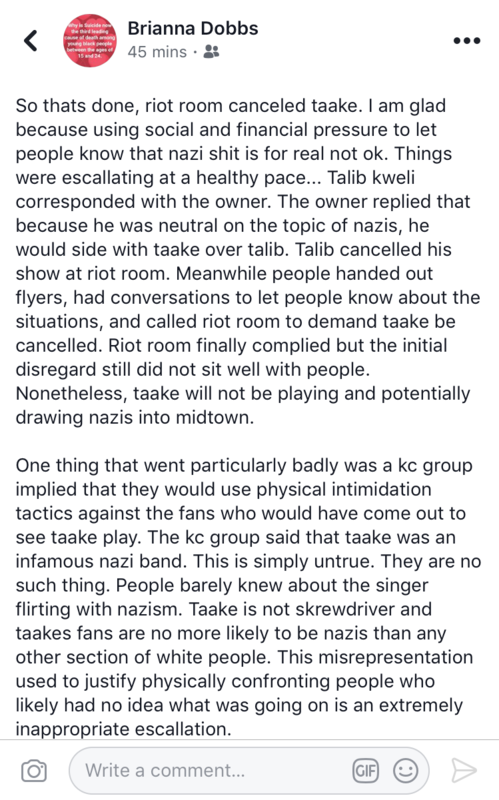 Since the videos have been exposed they have spread like wildfire, with numerous new outlets picking up the story, yet KCPD has remained largely silent beyond issuing a pathetic statement denying their collaboration with armed fascists. Of course the video and picture evidence proves the lies of the pigs for what they are, a lot of hot air. 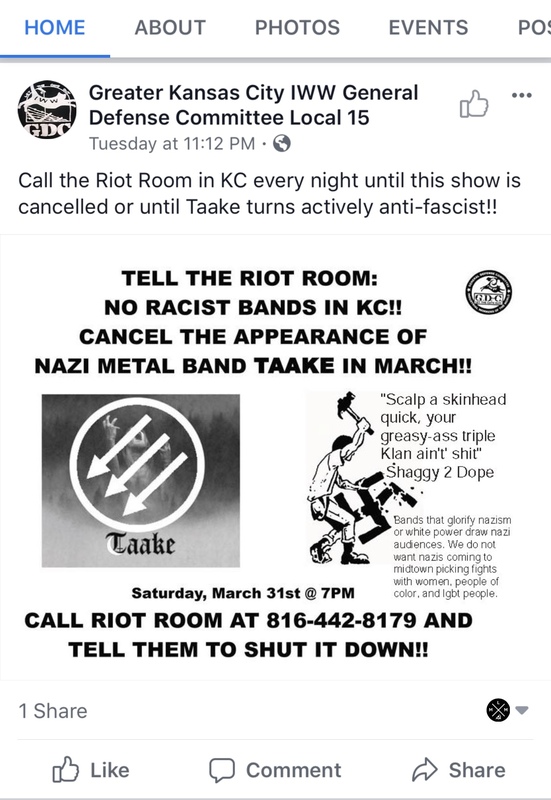 In this context we recognize the importance of self-defense, not only to resist local fascist goons, but their friends in the KCPD. Pigs and fascists are cut from the same cloth, and perform the same political function, that of crushing mercilessly the working class and its most militant and revolutionary detachments. Now this reality is being exposed to the masses in Kansas City. In their eyes the pigs and fascists have now become indistinguishable. Objective reality is transforming the consciousness of thousands of people, and it is the duty of us communists to mobilize and organize the masses into a fighting force. This is why we encourage members of our class to attend collective self-defense classes, to familiarize themselves with the techniques of street fighting and disarmament. These are techniques that are necessary when engaging in any combat with fascists. But we must also now insist on training with arms. We should never fall behind the enemy, in fact we should be several steps ahead of them, and our enemy has always been armed. If we wish to protect ourselves, our class, and defeat the horrors of organized fascism then we must pick up and familiarize ourselves with the gun. Every protest should be viewed as a school of war, and every war requires disciplined self-defense without exception. We mean to make war on capitalism, imperialism, and fascism. We learn war through making it, just as we learn the gun by picking it up. Practice has served as our greatest teacher, and will continue to do so. We see no greater service to the People than by propagating, strengthening, and broadening self-defense programs and training, both armed and unarmed, to stave off fascist terror. We will not fail in our task.